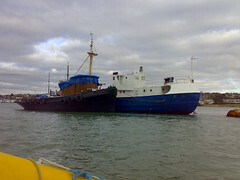 So here's the Humber Star, right after she has been re-floated. On arriving back at Lady Jane, it was obvious from the activity down the river that the Humber Star was being re-floated, so I nipped down the Itchen to get a few pictures of the process. In the event, she was already well afloat when I got there. Her deck was swarming with all kinds of people in high viz jackets and helmets. I can't even begin to imagine the issues they still have to deal with as a result of her sinking. I've been away travelling, so have not had time to tend the blog. I was miles away - honest. 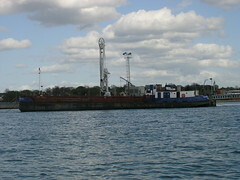 I've only just heard that the Humber Star has sunk, off of Woolston. I'm genuinely sorry to hear the news, despite what's happened. I bet that's going to make the insurance company weep though. Reports are saying she had hundreds of tonnes of effluent on board when she sank, though I suspect the truth is that pretty much all of the effluent would have been pumped out before the crew left for the day, as that's what is normally done - as the picture above shows. 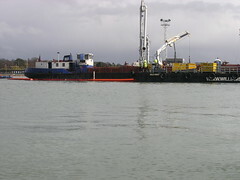 I'm also thinking there will be a bit of a scramble to get a replacement vessel on station, as that effluent needs transporting down the Itchen daily. The plywood cladding in the galley is coming along. Cutting these complex shapes is a much slower process than I'd first anticipated. The only way to get this done is to get my head down and steadily work at it. It will be worth it when it's done I tell myself. It is happening, just a little more slowly that I'd like. 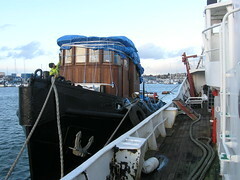 Amongst everything else that has been going on, I found some time to get more wood cladding into the galley. 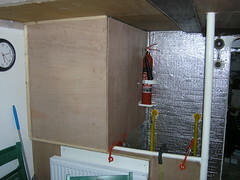 Actually, I replaced the piece you can see above the radiator, using a thicker piece of ply. The thinking being that this will need to be able to support shelving at some point. It was a comment by one of my anonymous readers that set me to thinking of doing this. Thanks for that. It turns out that I'll need to use thicker ply elsewhere, as some of the steel faces that I thought were quite flat bow too much for the thin ply to sit snugly up against. Ah well, all part of the great learning process. So I've finally got around to making up a bracket to hold the sensor for the rev counter. I opted to mount it up against the cam shaft, which will hold the magnet, as it's much more accessible there than on the main shaft. Also things down towards the main shaft are considerably more dirty, and therefore potentially more troublesome for the electronics, in comparison to where it is now. It's temporarily held in by the oversize self tapping screws you can see, because I didn't have any of the right size set screws on board. 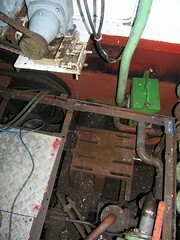 There is always some routine maintenance job or other to do on boats, Lady Jane is no exception. Here you see my freshwater pump - it periodically pumps water into a pressurised holding tank whenever the water pressure drops below a certain point. 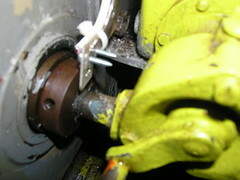 The packing on the pump needs tightening every now and then, and occasionally replacing. 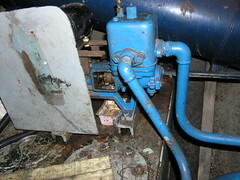 If this is not done, as happened last weekend, the pump gets air in it and will not pump the water back up to pressure. Not difficult to sort out, but a nuisance. Other maintenance tasks on the weekend involving pumps were: Pumping diesel into the day tank for the central heating and pumping saltwater into the toilet header tank. I usually try to get the maintenance jobs done at the beginning of the weekend, leaving me clear for other boat projects, though this does not always happen. Interesting weather we have been having in the last few days, to say the least. It's swung between snow, big winds and driving rain, with brilliant sunshine in between it all. Here you see Seb putting the finishing touches to the 'weatherproofing' of Wendy Ann 2's new wheelhouse, which is not quite finished yet. The abundant rope work and duct tape surround is evidence of a hurried covering in howling winds. Nervous moments for Seb, who was balanced somewhat precariously on top of what was, for a while, in effect a big sail. A few hours later, sunshine and calm. Here's the engine monitor console I've been working on. The figures you see are just test data by the way. The idea being the console provides a summary version of the streams of data I'm now collecting from the engine. The three key gauges are shown, along with status indicators for the various data feeds. Easy for anyone to read and assimilate, even at a distance. For running the engines all day and all night, I figure this all most skippers would want to know anyway - is everything ok, or not. The charts and history are always available if needed, on another tab of course. I'll also program in a hi/low alarm capability for each of the pressure and temperature sensors, and relate this to the engine RPM sensor. Ultimately, the status indicators will show green for ok, red for an alarm condition and blue for a sensor fault. I'll also have a few free slots on the PIC16F88 chip I'm using, so will probably also show some green/red status indicators on the control box itself, independent of the PC - just in case. The first of the pressure sensors, the oil pressure, is now connected. I would say installed, but it's only held in place with tape at the moment, pending the creation of a proper bracket to hold it permanently. 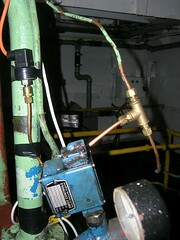 The oil pressure sensor had to be 'teed' into the copper piping which runs up to the wheelhouse, as the engine has no place for me to otherwise connect the sensor. As it happens, in the picture, you can see the places where the turbo, in the foreground, and the freshwater pressure, where the old switch is, sensors will be mounted. Fitting the oil pressure sensor did not exactly go according to plan as the threads were all the wrong sizes. I remembered seeing Fred from Marine Systems Engineering building a panel with exactly the same copper piping as that you see in the picture, for a marine gas installation. A quick visit or two to Fred for parts and advice, and everything came together beautifully. With Seb cranking on the main engine manual oil pump below, and comparing with the wheelhouse oil pressure gauge, I could see the sensor was working perfectly. No leaks either. Just a bit of programming on the microchip, a PIC16F88 for those who are interested, and on the PC and I'll have the pressure, temperature and RPM engine sensors all working together beautifully. So that's my troublesome 24V generator, which runs off the main engine, out. I would have taken a picture of the actual generator, but forgot. So all you see is where it came out of. The reason for taking it out is that the bearings have gone, so when I last ran the engine it was making a huge noise, and was running hot. As it turns out, the company I would have taken it to for refurbishment seems to no loner exist, so now I guess I'll have to make another plan. In what is probably a once in a lifetime experience, both Seb's and my blogs came together in the form of our respective vessels being alongside each other last week. Seb & Becky needed a nearby 'staging post' on their voyage from the very expensive Saxon Wharf launching dock, round to their final destination. As was inevitable, much time was taken up with comparing notes on various phases of our respective projects, the sharing of ideas and experiences and, of course, reminiscing. The whole process was aided by the liberal consumption of beer and wine. A very productive and enjoyable weekend.